Figure 1: Allograft is placed in large mandibular defect created by an expansive dentigerous cyst. Dentigerous cysts can be expansive and cause a large amount of bone loss. I have seen a case where a large dentigerous cyst resulted in a pathologic fracture of the mandible in a dog. Therefore, it seems valid to consider a bone graft material to fill these large defects after removal of the unerupted tooth and curettage of the cystic lining (Figure 1). This is just one of many possible uses for bone grafting in oral surgery. Other uses include treatment of vertical bone loss due to periodontal disease, placement of bone grafts at the site of mandibular fractures, and use of cortical and cancellous bone grafts for mandibular reconstruction after mandibulectomy. Options for bony defects include osteoconductive and osteoinductive materials. Osteoconduction is accomplished by grafting materials that act as a scaffolding on which existing bone can lay down new bone. Osteoinduction refers to substances that stimulate differentiation of osteoprogenitor cells into osteoblasts that then begin new bone formation. Products that contain bone morphogenetic proteins (BMP) are osteoinductive. The term autograft refers to a bone graft obtained from the same patient. An allograft is a graft obtained from a different animal of the same species. Xenografts are grafts obtained from a different species than the recipient. Although I rarely use bone graft materials to fill the alveolus of an extraction site, this has been described as a means to maintain alveolar bone height.1 Generally, maintaining bone height in veterinary patients is clinically less important than in humans, where post-extraction placement of dental implants in an area of good bone stock may be more common. A bone graft product might be chosen when large voids are created by extraction, such as after bilateral extraction of the mandibular canine teeth. These teeth make up such a large portion of the mandible and extraction of these teeth results in a rostral mandible that is much more narrow than when the teeth are present. 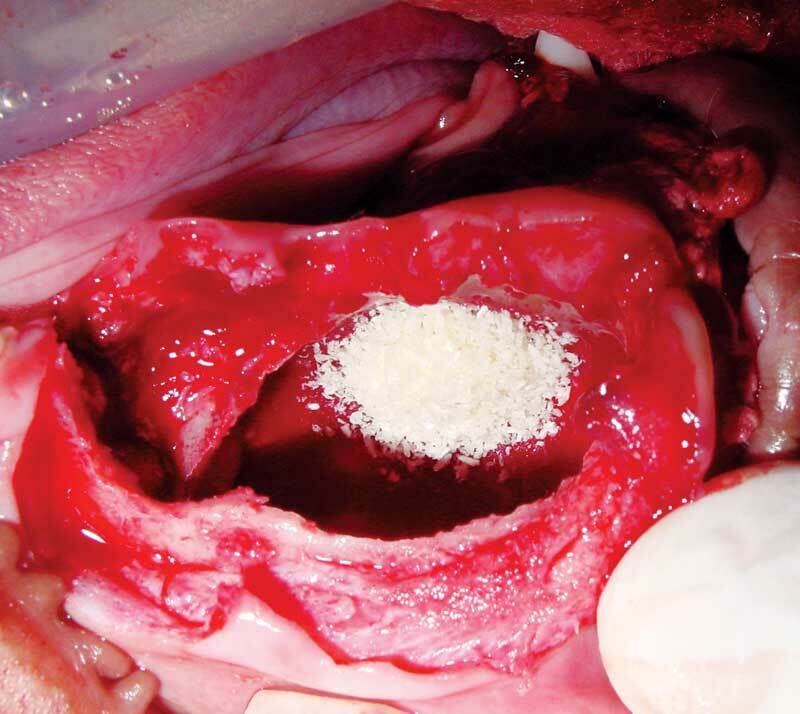 However, many veterinary dentists believe the clot that forms in an extraction site is sufficient to act as the scaffolding for bone to traverse the alveolus. Similarly, some veterinary dentists prefer not to place bone graft into the site of an enucleated dentigerous cyst, feeling that the blood clot that remains after closure of the site will have the ability to act as a scaffold. Another theoretical concern for use of a bone graft is the fact that BMPs within a graft may stimulate growth of an existing tumor if there is one present. As dentigerous cysts have been documented to occasionally transform into a malignant carcinoma, placement of a bone graft prior to obtaining a definitive diagnosis may add fuel to the fire if neoplasia is present. Bone grafts also may be used for guided bone regeneration in treatment of periodontal bone loss. 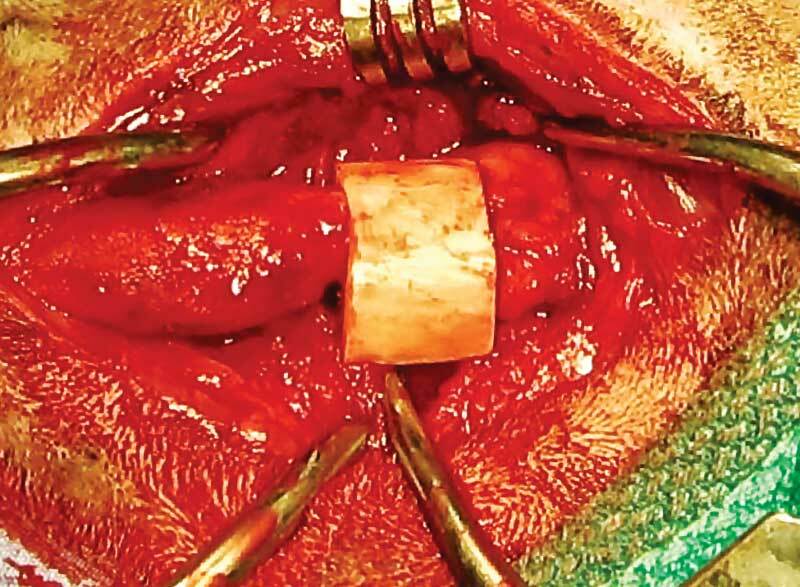 Treatment of vertical bone loss may involve closed or open root planing and placement of an osteoconductive or osteoinductive substance in the pocket, followed by placement of a membrane to retain the graft and minimize epithelial migration into the graft. Figure 2: Cortical allograft is placed in a mandibular defect of a dog. The process of bone repair differs from soft tissue repair. Bone, similar to soft tissue, undergoes stages of healing including inflammation, phagocytosis of cellular and organic debris, cell proliferation and granulation tissue formation. However, bone repair differs from soft tissue in that its repair process does not produce scar tissue.2 Bone can be completely regenerated rather than repaired. Broken bones can heal via indirect or direct bone healing. Indirect bone healing occurs in an area of mechanical instability with resorption of fracture ends and callus formation. Granulation tissue gives rise to interfragmentary connective tissue, which eventually is remodeled into fibrocartilage. Fibrocartilage is resorbed, and osteoblasts produce osteoid that is eventually remodeled to reconstruct the lamellar orientation of bone. Direct healing can be further categorized as either contact healing or gap healing. Stable, anatomic fixation with perfect interfragmentary contact allows for Haversian cutting cones to cross the interface. Many options exist when it comes to treating bone loss and maxillofacial fractures. Bone grafting materials and autogenous bone harvesting should be considered for cases that may benefit from their use. 1 DeForge DH. “Evaluation of Bioglass/PerioGlas (Consil) synthetic bone graft particulate in the dog and cat.” J Vet Dent. 1997; 14: 141-145. 2 Harle F, Boudrieau R. “Maxillofacial bone healing.” In: Verstraete FJM, Lommer MJ, eds. Oral and Maxillofacial Surgery in Dogs and Cats; 2012: 7-13. 3 Snyder CJ, Bleedorn JA, Soukup JW. “Successful Treatment of Mandibular Nonunion With Cortical Allograft, Cancellous Autograft, and Locking Titanium Miniplates in a Dog.” J Vet Dent. 2016; 33(3): 160-169.